In 1937, the Belgian Air Force selected the Balmoral to replace the Battle as the standard bomber. The first of 144 production aircraft rolled off the production line at Gosselies during mid-1938. Dimensions: 60.3/ 44.7/ 13.6/ 530 sq ft; 1x 2,625hp Bristol Centaurus X radial; max weight 22,150lb; max speed 292mph at 14,000ft; range 1,096 miles and service ceiling 25,000ft. A two-seat low-wing single-engine monoplane light bomber/reconnaissance aircraft with a retractable tailwheel undercarriage, with the mainwheels retracting backwards into the wing. The pilot and observer were located in individual, widely separated cockpits. A small ventral bay holds two/three cameras or can be fitted to carry two 50 kg bombs. The prototype flew on 16 February 1936 but the decision to build the Fairey Balmoral under licence saw the S.47 reconfigured as a reconnaissance type and the prototype’s Hispano-Suiza engine was replaced by a Rolls-Royce Merlin to provide compatibility with the Balmoral fleet. The prototype flew again on 3 September 1938 and production of 36 aircraft began soon after to replace the Renard R.31 fleet. A small three-seat light bomber and light transport. The prototype first flew on 2 February 1938 and production for the Belgian Air Force began during 1939 to meet a requirement for a bomber aircrew trainer equipped for bomb-aimer, navigator and radio operator training. 65 were produced. Twelve were also built as transports as the S.48B with space for two pilots and five passengers. The S.48C is a civilian airliner version with a pilot and six passengers. In Britain, Fairey produced a private-venture land-based ground attack variant of the naval Fairey Spearfish dive/ torpedo-bomber. A prototype was converted from the second prototype, which flew in August 1944. The RAF selected the type to replace the Hawker Henley and Bristol Balmoral and the first entered service during late 1945. At the same time, Belgium selected the aircraft to replace their Balmoral fleet and 144 were ordered from Avions-Fairey. The first production aircraft was delivered in May 1946. The main changes from the Spearfish are; removal of wing folding and arrestor hook, the ASV search set; the addition of some armour plating and improved self-sealing wing tanks; four 20mm cannon in the wings and the internal bay can carry either bombs or an extra 2955 litre self-sealing gallon fuel tank or an under fuselage cannon pack with four 20mm cannon. Underwing armament can consist of either eight rocket projectiles, two bombs or two 40mm Vickers ‘S’ guns in pods or two standard drop tanks can be fitted. The gunner has a remotely controlled turret armed with two 13.2mm FN-Browning machine-guns. In 1948 the company began working on military versions of the Fairey FB-1 Gyrodyne designed by Dr J.A.J Bennett and first flown in Britain on 4 December 1947. The Gyrodyne features a three-bladed rotor and an anti-torque rotor on a starboard stub wing which provides added thrust, both powered by a single piston engine. The first Belgian-built prototype made its maiden flight on 18 November 1948 and was followed by two refined versions with Avia-Minerva engines in early 1949. During 1950 eight pre-production aircraft were built and a production batch of twelve GM.1 and ten GR.1 aircraft. 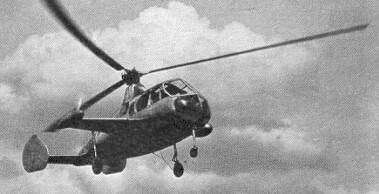 In Britain work continued on further developments as the ‘Jet Gyrodyne’ with the addition of tip jets on a new large two-bladed rotor fed by compressed air from an Alvis Leonides radial that also powered two propellers on two stub wings for extra thrust. The first free flight took place in January 1950. Seeing the benefits the Avions-Fairey team switched their efforts, a prototype flying in June 1950 and ten pre-production examples following the following year. This is the maritime patrol variant of the T.X bomber. 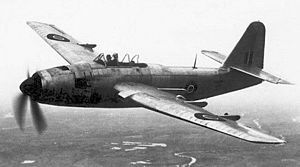 Changes from the land-based bomber include wingtip tanks, a powerful searchlight in a pod under the port wing, removal of the ventral turret and the remote-control turret system, addition of side observation windows and Boulton Paul N nose turret designed for strafing as well as a larger galley and rest facilities. Torpedoes and depth-bombs can be carried under the wings. The prototype flew on 19 March 1945 and the type entered service in early 1946. 8 crewmen are carried. In 1949 Belgium brought 12.